Low energy, poor memory and brain fog are common day epidemics. Lowered cognitive function results in lowered working efficiency, relationship disputes and significantly reduced quality of life. Certain foods and herbs have the potential to boost brain function naturally. 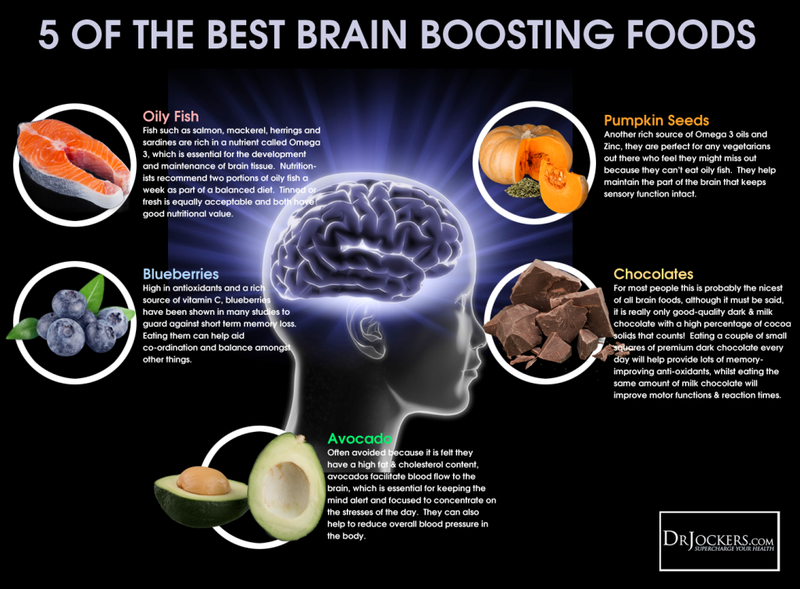 Learn all about some of the best foods to improve brain function in this article. The brain is extremely sensitive to free radical damage, poor circulation and poor blood sugar balance. Individuals with chronic inflammatory stress, arterial restriction and blood sugar imbalances will have trouble with memory, cognitive function and brain fog. The brain and nervous system need a blend of saturated fat and omega 3 fatty acids as well as trace minerals, B vitamins and anti-oxidants in order to function well. Here are a group of amazing foods and herbs that have a great effect at quenching neurological free radicals, enhancing blood flow and improving blood sugar balance. There are WAY MORE than 7 brain boosting superfoods. I just decided to choose that number for this post and if you incorporate these ones, you will enjoy their great flavors and help to take your brain function to the next level. Remember, that if you have severe leaky gut syndrome and auto-immunity you may have unique food sensitivities and may not be able to tolerate these foods. You can always try doing a biofeedback food sensitivity test, an elimination diet and/or a food sensitivity blood test to find out. Coffee gets a bad wrap in the health food world but it has some extraordinary benefits for the gut microflora and the brain. Coffee is loaded with powerful brain enhancing and blood sugar balancing polyphenol anti-oxidants. These anti-oxidants are chlorogenic and caffeic acids which have a powerful effect on enhancing insulin signaling and blood sugar metabolism (1, 2). Coffee polyphenols also improve the quality of our gut microbiome by favoring the development of healthy microbes that reduce inflammation and improve fat burning (3, 4). Stable blood sugar and improved gut microflora allow for better energy, mental clarity, improved hormone function, enhanced detoxification capabilities and weight loss. It is important to get your coffee from an organic variety to ensure that is free of chemical toxins. I don’t recommend drinking more than 1 (8 ounce) cup daily as excessive caffeine can be problematic for individuals struggling with adrenal fatigue. If you are caffeine sensitive than avoid it within at least 8 hours of your bedtime. This favorite superfood is rich in epicatechin which is a powerful polyphenol anti-oxidant (5). It also contains theobromine which is a natural cardiovascular stimulant that enhances blood flow to the brain (6). Theobromine is both safe and non-addictive and has shown clinical benefits with improved memory and cognitive processing (7). Cacao is the raw form and contains the most anti-oxidants. Minimally processed dark chocolate has slightly less. Both forms help to improve our gut microbiome by favoring the development of bacteroidetes species. The bacteroidetes species improves our energy production, reduces inflammation and stimulates fat burning. This is one of the most anti-oxidant rich herbs that also plays a powerful role in blood sugar stability. Cinnamon has an incredible ORAC (Oxygen Radical Absorbency Capacity) score is 131,420 (8). This helps protect the neurons from free radical stress and stimulate insulin receptors which allows for greater blood sugar stabilization (9). Improved blood sugar enhances memory, cognitive acceleration and overall quality of life. Cinnamon also improves brain-derived neurotrophic growth factors (BDNF) which enhances the overall healing and regrowth of neurons and synapses (10). Add cinnamon to fruit dishes, smoothies and any sort of healthy or unhealthy dessert recipe you consume. Try this Super Cinnamon Roll smoothie and the cinnamon almond butter fudge bars. This herb is a great brain stimulant that prevents the breakdown of a key neurotransmitter named acetylcholine. This molecule allows the neuronal cells that are responsible for cognitive processing and memory consolidation to communicate more effectively with one another (11). When this happens you experience better memory and enhanced overall brain function. Using a good herbal mix like Herbamara with rosemary and other organic herbs on meat and vegetables daily is a great way to consume rosemary. In addition, you can get rosemary essential oil and put it in a diffuser in your office to maintain focus and concentration. These unique phytonutrients which are together classified as vitamin P have shown to improve capillary permeability and blood flow. The helps to oxygenate the deep regions of the brain that are critical for cognitive processing and sensory acuity (12, 13). Fresh squeezed lemon and citrus essential oils are rich in these bioflavonoids. Squeeze lemon in your water and herbal teas and use lemon essential oil on your neck and scalp to improve blood flow and cognitive function. 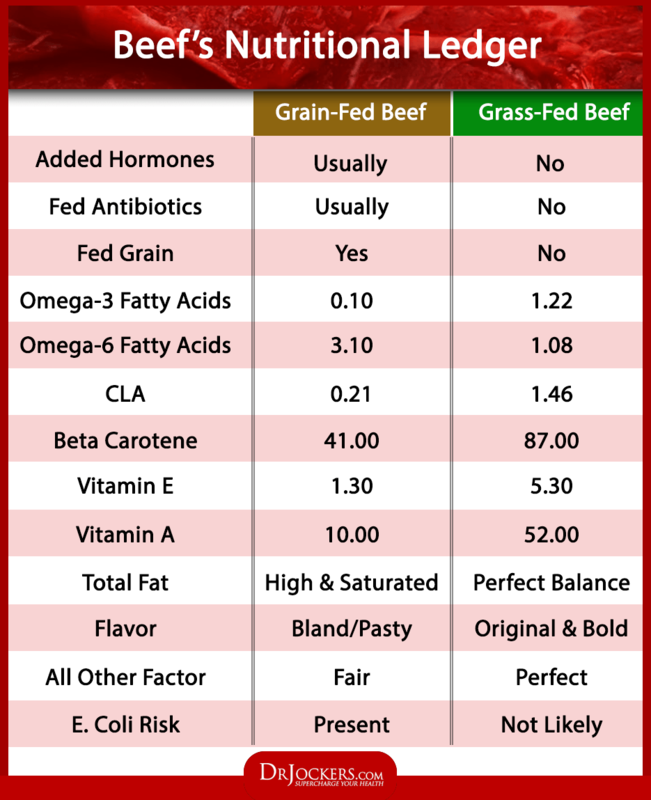 Grass-fed beef contains significantly more omega-3 fatty acids, CLA, saturated fat, vitamin B12 and carnosine than grain-fed beef. They also have much less inflammatory omega-6 fatty acids and environmental chemicals (14). These key nutrients play an enormous role in the foundation of the neuronal cells that makeup the central nervous system (15). The brain concentrates carnosine to protect itself from advanced glycolytic enzymes (AGE’s) which are the most hazardous free radicals and are linked with neurodegenerative disorders such as Alzheimer’s and Parkinson’s disease (16). Consuming high quality grass-fed beef can be extremely helpful for optimizing brain function. This super seafood is loaded with long-chain omega 3 fatty acids EPA & DHA which are crucial for healthy neurology and brain function (16). Additionally, wild salmon is rich in astaxanthin which not only gives it a characteristic pink color but is also credited with giving the fish its super strength to swim upstream against strong currents (17). My Brain Support Pack is designed to get you the key nutrients that are necessary for optimal brain function and cognitive processing. These nutrients help the brain to produce the right amount of neurotransmitters and other neurochemicals. 9. Qin B, Panickar KS, Anderson RA. Cinnamon: Potential Role in the Prevention of Insulin Resistance, Metabolic Syndrome, and Type 2 Diabetes. Journal of Diabetes Science and Technology. 2010;4(3):685-693. 11. Moss M, Oliver L. Plasma 1,8-cineole correlates with cognitive performance following exposure to rosemary essential oil aroma. Therapeutic Advances in Psychopharmacology. 2012;2(3):103-113. 14. Daley CA, Abbott A, Doyle PS, Nader GA, Larson S. A review of fatty acid profiles and antioxidant content in grass-fed and grain-fed beef. Nutrition Journal. 2010;9:10. I thank you very much for all your work. I learn so much about health from you. I have MCS and upon exposures to chemicals, my brain can “act up” and consequently, anxiety, sometimes, anger, etc., can occur. One day during an episode, I just happen to be eating coconut butter and after consuming a tablespoon, i suddenly became very peaceful, calm… I was in utter amazement how this could happen so suddenly. Now, i enjoy it everyday to keep myself calm. What is in coconut that would alter my brain function so quickly? Is it the MCT’s? What about the body getting too much caprylic acid from over consumption of coconut? This happened to Wendy Meyers. Yes the MCT’s will stabilize your blood sugar and provide fuel for your brain. When you are hypoglycemic and don’t have the fuel your brain needs, it can lead to anxiety, irritability, etc. If you overdo MCT’s, you will get diarrhea, so if you notice that…than back down.